I've been a little Paris-obsessed lately, with having read Insatiable (where Gael Greene recounts her many gastronomic trips to the city of lights) and Julia Child's My Life in France . I've never been a Paris freak...until now. Now, I feel that tug towards Paris. Just a tad late...a couple good friends of mine from high school just moved back after living in Paris for a few years. Damn! So, I've tried to fulfill my Paris longing with French films (like Paris, Je T'Aime ) and foods...hence the Boeuf Bourguignon. In both books, the authors mention roasted chicken as the quintessential French dish. While I've roasted chickens and turkeys before, I'd never cooked a fresh, farm-raised chicken. That's why I decided to drive out to Benne's farm earlier this week. Julia goes on and on in her memoir about how fresh, organic chickens taste better--more "chickeny"--than supermarket birds. I wanted to see if that was true. Plus, I have just read through Nigel Slater's Appetite , in which he has a recipe for "classic, unmucked-about-with roast chicken". He writes, "Don't believe any of the smart-arse recipes you see for roast chicken. This is the one. 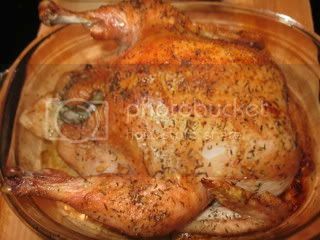 Basic roast chicken, its skin crisp and buttery, its juices savory and aromatic--and quite possibly the best meal in the world." How could I not try that? Since I wanted to taste the chickenyness of my bird, I dressed it simply with olive oil, salt, pepper, thyme, & lemon. I cooked it at 375 for 1 hour, rotating the pan occasionally but not turning the bird (as Julia and Alice Waters suggest) or basting (which Slater doesn't deem necessary). While the skin browned and crisped nicely, the meat wasn't quite done after an hour. So, I put it back in and check it every 10 minutes or so. I took it out after another 45 minutes. At this point, I think it was a little too done; the meat was kind of tough. Although, I don't know if it was overcooked or if that's just how the meat in fresh birds taste, as I was told by Jolene that her birds have a denser meat than grocery store brands. My roasted chicken was far from the best meal in the world. In fact, I hate to admit it, but those rotisserie chickens you can buy at the supermarket deli...there are better than the chicken I roasted last night. The food pics keep getting better. Sorry the chicken didn't turn out as you expected, but it may have something to do with the lack of chemicals and tenderizers pumped into it. I wouldn't be too quick to blame you as the culprit. And congrats congrats again on being named the number one food writer in the area! As for the "number one food writer"thing...it's just that if you go to FoodBuzz.com and go to the page for Illinois foodies, I am listed as the person with the "most buzzed page" right now. I think that's pretty cool. Hope you're enjoying the snow day! I'm reading My Life in France right now as part of The Kitchn's book club! Like you, I was never all that interested in Paris, but after reading a couple of Julia's chapters I want to go NOW! Have you read Hemmingway's A Moveable Feast? It's about his time in Paris. I was struck by how Julias first chapter seemed like a contiuation of A Moveable Feast...complete with Bumby Hemmingway! I wrote a little about the book as part of my summer reading searies Here. For roast chicken I use Nigella's recipe and it has never once failed me. It's simple. Rub the bird with butter, salt and pepper, stick a lemon (I cut it in half) in it's bum and cook in a 400 degree oven for 15 minutes per pound plus 10 minutes. Crispy skin and juicy meat every time!